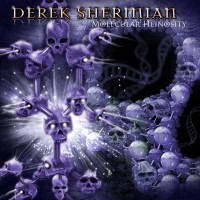 As the keyboardist for Dream Theater, Derek Sherinian always brought an element of straight-ahead hard rock to the known kings of high-chops progressive metal, so it’s ironic that his output following his tenure with that band has actually veered into stranger, arguably more progressive territory. With his Planet X and assorted solo works, Sherinian has found a certain comfort in his personal brand of prog/jazz/metal fusion, but Molecular Heinosity finds Sherinian braving considerably stranger new territory, even by progressive instrumentalist standards. Some of this heaviness stems from Sherinian’s career in (and affinity for) classically heavy music, but a good deal also comes from the supporting cast playing alongside Sherinian, notably former Ozzy Osbourne drummer Brian Tichy in place of the more jazz-leaning Simon Phillips, but it is even more notable in the contributions of the mightily bearded gunslinging guitar work of Zakk Wylde. Wylde’s style would probably never be described as progressive or forward-thinking, which makes the odd-meter result of his work with Sherinian a shocking surprise. On the straight-ahead, Satriani-on-PCP rocking of “Wings of Insanity,” Wylde and Sherinian trade solos over a furious down-tuned riff that wouldn’t be out of place on any of his numerous Black Label Society albums (pinch harmonics and pentatonic shredding aplenty), but it’s closing epic and lone vocal track “So Far Gone” that allows both instrumentalists to shine their brightest. Opening with a creeping piano line and building into a sludge-riff dirge, Sherinian’s haunting keyboard atmospherics and odd time signatures give Wylde a new platform for his low-end stomping. It breathes a lot of new life into his time-honored style before kicking into a highly aggressive middle section featuring a pair of scorching solos from each player, then ending again with an eerily melodic, acoustic-driven outro. Where the Wylde-driven songs rely on brute force for heaviness, the remainder of the disc builds more out of a combination of mood and groove; Sherinian has always been a master of the ambient pads, but throughout Heinosity the songs actually create their own feel rather than relying on production or instrumental assistance. Opener “Antarctica,” with its opening riff’s slight echoes of Tool, leans on Alan Holdsworth-esque soloing over the fluid rhythmic interplay of Tichy and bassist Virgil Donati, while the clinic of “Primal Eleven” turns a string of almost immeasurable musical passages into a surprisingly easy-to-headbang-to jam session. Clocking in under 40 minutes, Molecular Heinosity avoids most of the labor involved in listening to complicated instrumental music, not just by making the songs relatively short but by actually writing songs. It’s true the disc almost entirely avoids vocals, but that doesn’t mean it lacks lyricism. The tracks are complicated without being difficult, and Sherinian never confuses his music with its musicality. If that’s not a progressive idea, nothing is.